What Technological Breakthroughs Has Airwheel H3 Electric Wheelchair Made? Abstract: Besides comfortable riding experience, Airwheel H3 foldable electric wheelchair has made some technological breakthroughs, which broadens application field and enlarges consumer base. It is able to cover almost all travel demands of all people, especially the people who are wheelchair-bound. Being the leader in intelligent gadgets sector, Airwheel feels obliged to design different types and satisfying different demands from all people. As one of the new arrivals, Airwheel H3 lightweight folding wheelchair has done great job in solving all kinds of travel needs of people and offering comfortable riding experience. All of them benefit from the technological breakthroughs that have been made by H3. Airwheel H3 is the only smart electric wheelchair type that adopts intelligent joystick controller, making it super easy to control. It moves forward and backward by pushing the handlebar controller forward or backward and it turns directions if you turn it left or right. H3 will automatically brake when your hand doesn’t touch the controller. The controller contains server buttons with different functions. Press the power button and the power is on, then press the button for another time, the power is off. Press the slower speed once, and the speed will be reduced by one level; Press the higher speed once and the speed will be increased by one level. Press the button the buzzer will buzz; Release the button, the buzzer stop buzzing. Then, long-time and long-distance riding becomes easy to realize. However, it is not enough at all. 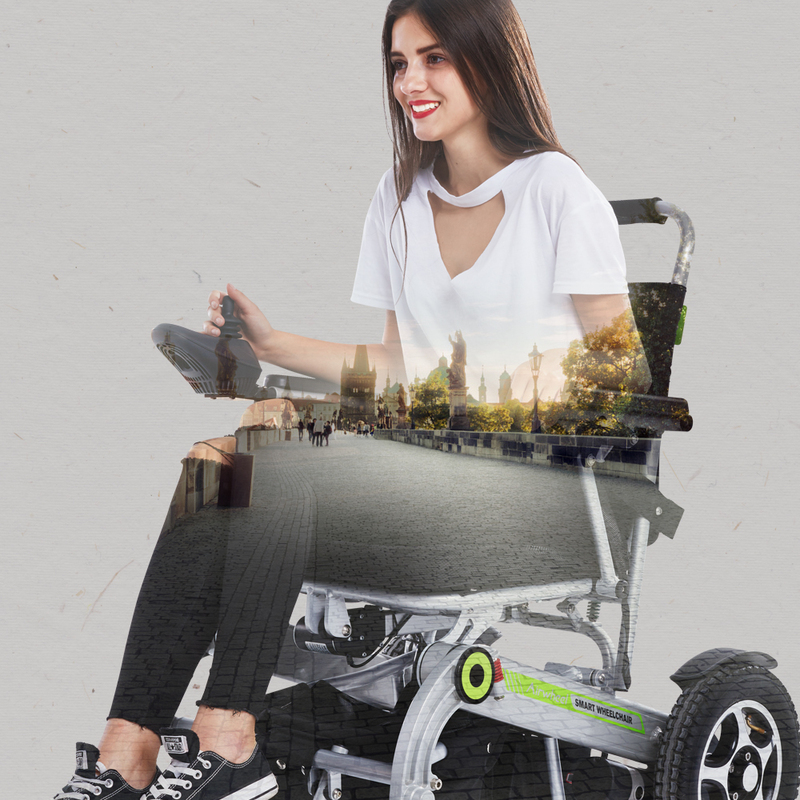 In order to ensure smooth and comfortable riding experience, Airwheel H3 electric folding wheelchair adopts shock absorption system to absorb shock on bumpy roads and to control when going downhill to protect personal safety. What is more, the automatic folding brake system is another highlight in technological breakthroughs. There is an automatic folding switch and riders just press it and they can get a smaller volume. Additionally, Airwheel H3 handle controlled electric wheelchair allows riders to ride in dual ride modes. Pull the tie rod to the open position, H3 can be pushed by people. When people pull the tie rod to the close position, it can be ridden by electricity. High safety and comfortable ring make Airwheel H3 an important partner in life.